White Peach Frangipane Galette ~ galettes are wonderfully casual desserts perfect for cooks who don’t think they can manage pies. No worries, pie was never this easy, this crisp, or this irresistible. I’m not sure why but I was never particularly a ‘galette person‘…I think I thought of them as sort of spartan compared to other desserts. So this is a departure for me, and a lucky discovery ~ I could have gone my whole life not knowing what I was missing. 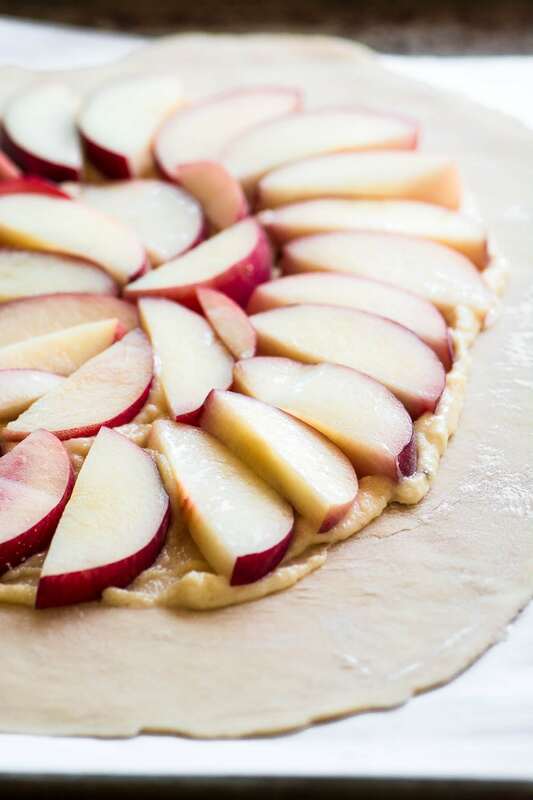 I’m going to call this out right at the start, the crust in this recipe is extra special, and it’s the main reason you should drop everything and make this galette. Like today. It’s buttery and crisp, almost like a puff pastry experience without all the work. 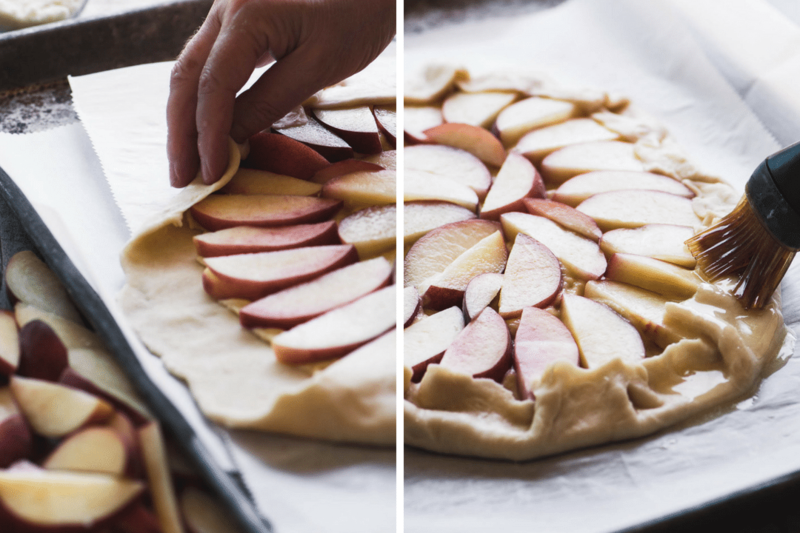 Whether you think you’re a ‘galette person‘ or not, you won’t regret making this. The layer of frangipane and thinly sliced peaches is just right with the fabulous crust, they complement each other perfectly. 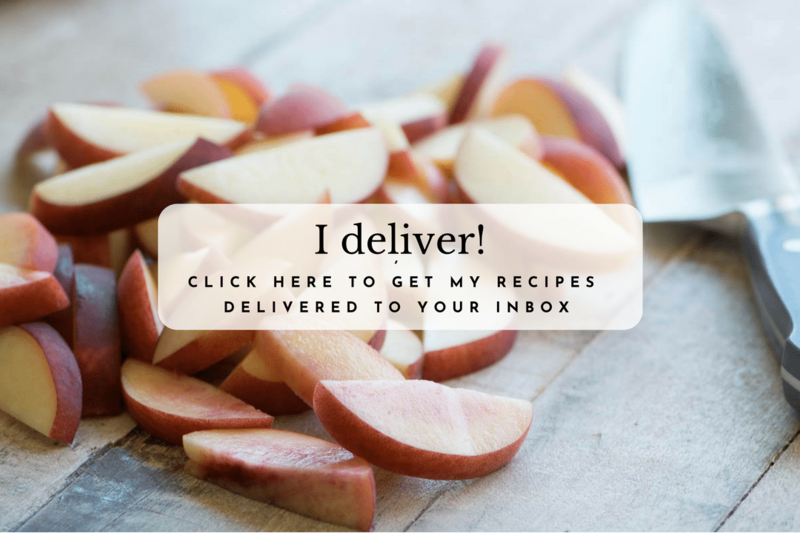 I used white peaches because I love them, and that’s what I had, but you know the drill…use any stone fruit you like. What’s the difference between white and yellow peaches? White peaches look the same as yellow peaches on the outside, but inside their flesh can range from white to pale yellow, to rosy pink. 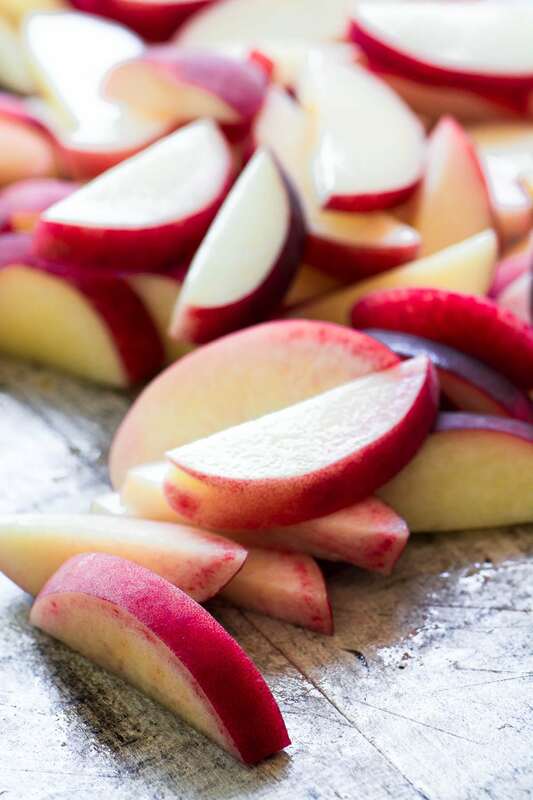 White peaches are more delicately flavored, less acidic, and sweeter than the yellow variety. They have subtle floral and berry overtones. White peaches have a more delicate texture, too, so they’re best for recipes where they won’t be cooked for a long period, like this galette. White peaches are mostly grown in California, and they’re in season from May to September. . The very simple buttery galette dough, or pâte brisée, is a gorgeous dough that bakes up crisp and tender. It’s from the great Alice Waters, and it’s flawless, so don’t be afraid of it. The second best thing about this galette is the layer of frangipane between the dough and the peaches. Frangipane is the most intoxicating filling made with butter, sugar, eggs, and almonds, I love it. 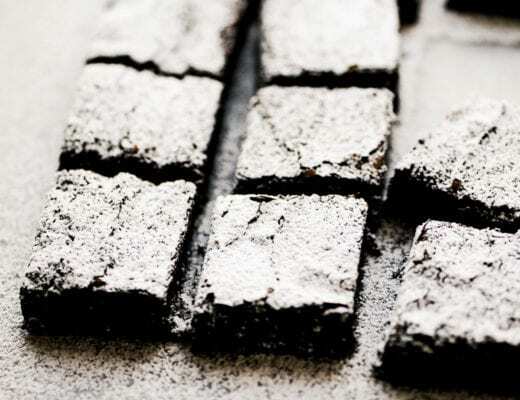 It only takes a few seconds to whip up, and makes this dessert just a tad richer and more special. The sliced peaches get arranged on top, and the dough is brought up around them. Just pinch it down any which way, no need to be super neat. 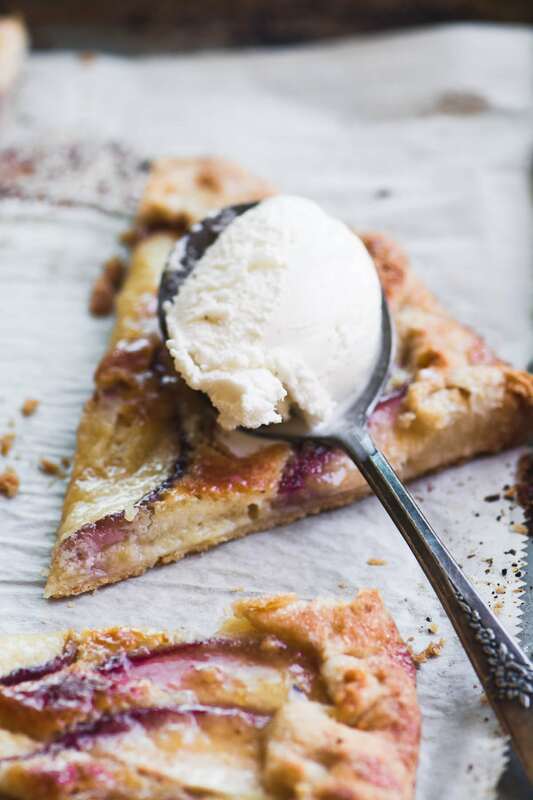 This white peach frangipane galette is the kind of dessert that’s actually fun to make, the pressure is off, because imperfect is exactly what you’re going for! To make the crust, put the flour, sugar, and salt in the bowl of a food processor. Pulse to combine. To make the frangipane whisk or process all the ingredients together until fluffy and creamy. Tear off a piece of parchment paper the size of your baking sheet and set the chilled disk of dough in the center. Using flour as needed to prevent sticking, roll the dough out to a 14 inch oval. 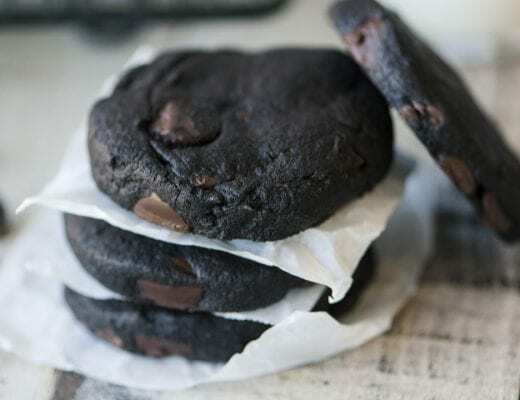 If you experience sticking, top the dough with waxed paper or plastic wrap. Transfer the paper with the dough to your baking sheet. Spoon the frangipane over the dough, leaving a 1 1/2 inch border all around. 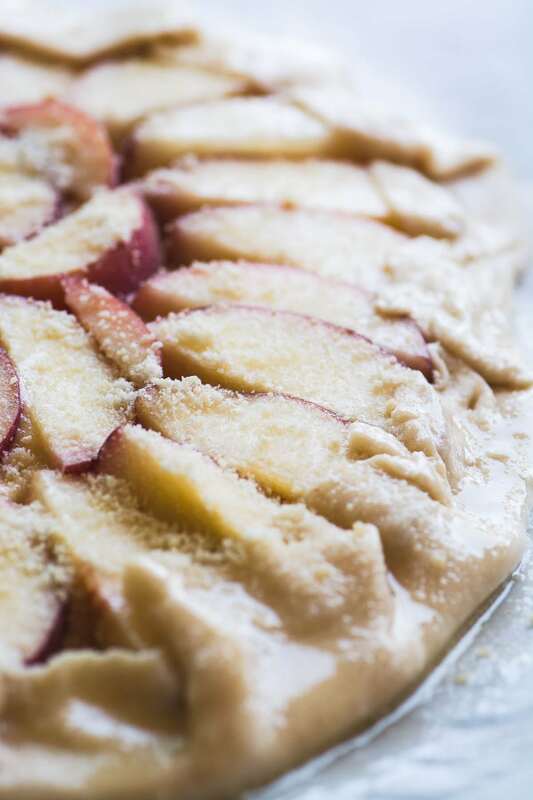 Arrange the peach slices in one layer (tightly fitted) over the top of the frangipane. Mix the ground almonds and sugar and sprinkle over the peaches. 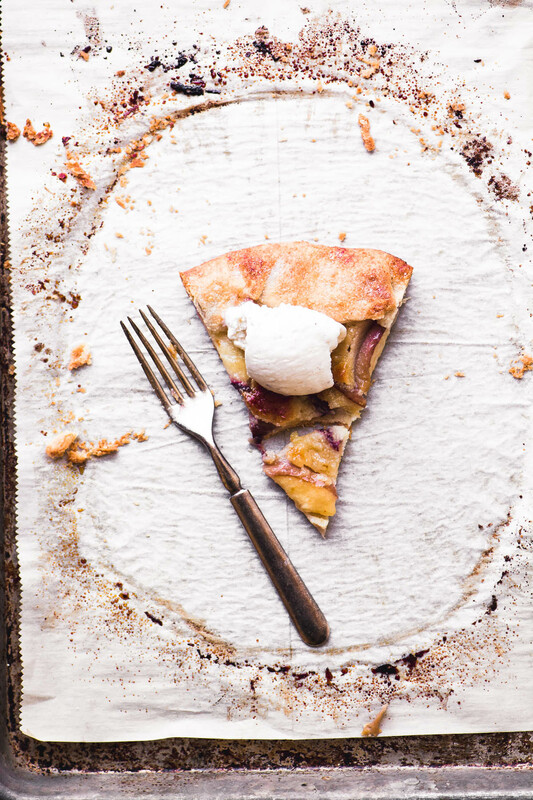 Bring the outer part of the dough up over the edge of the peaches to form a rustic crust, folding to fit. Don't worry about being super neat. Brush the outer crust with melted butter and sprinkle with sugar. Bake for about 35 minutes or until the crust is golden brown. Tent with foil if the crust seems to be getting too browned toward the end of baking. Note: make sure your oven is up to 400F before baking. If using the glaze, mix and melt the honey and jam together in the microwave and brush lightly over the peaches. Make it with different fruit ~ ue any fruit you like for the center of this galette…berries and other stone fruit work well. Try apples or pears in fall, and cranberries in winter. 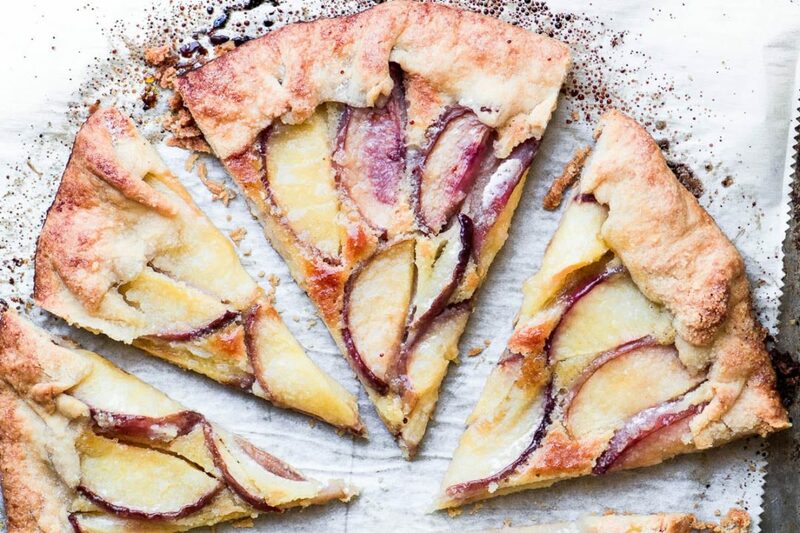 Make it with goat cheese instead of frangipane for a sweet/savory tart. Garnish with fresh thyme after baking. Make it for breakfast or brunch ~ serve it with Greek yogurt, mascarpone cheese, or creme fraiche. Make it simpler ~ leave out the frangipane. I love galettes! This one looks amazing! So delicious ? Thanks for explaining the difference between white and yellow peaches. I’ve seen you mention them before and wondered about them. Are they ‘free-stone’ and do they need to be peeled? Do you handle them just like regular peaches? I’ve never eaten any and I don’t think I’ve ever seen them in the stores or farmers markets, either. So, the hunt is on! I’m determined to find some! 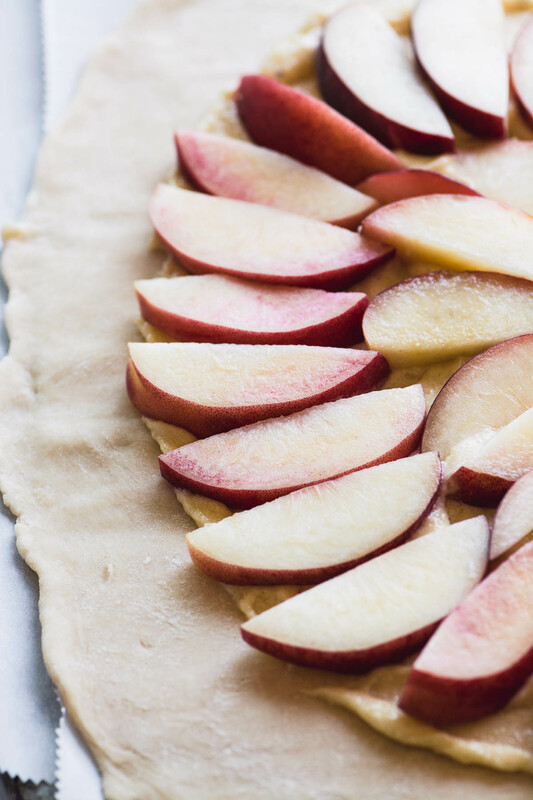 This galette is beautiful and its a recipe I’m going to tuck away to try when we start getting nice peaches! You use white peaches just like regular yellow ones, Lynn, but like I mentioned in the post, they have a lighter more floral flavor. I like to leave the peel on for flavor and color. You may not have noticed them in stores because they look pretty much like a regular peach from the outside, so watch the signage. I always love the combo of summer stone fruit with frangiapane! This is one gorgeous galette, Sue. This is so lovely! 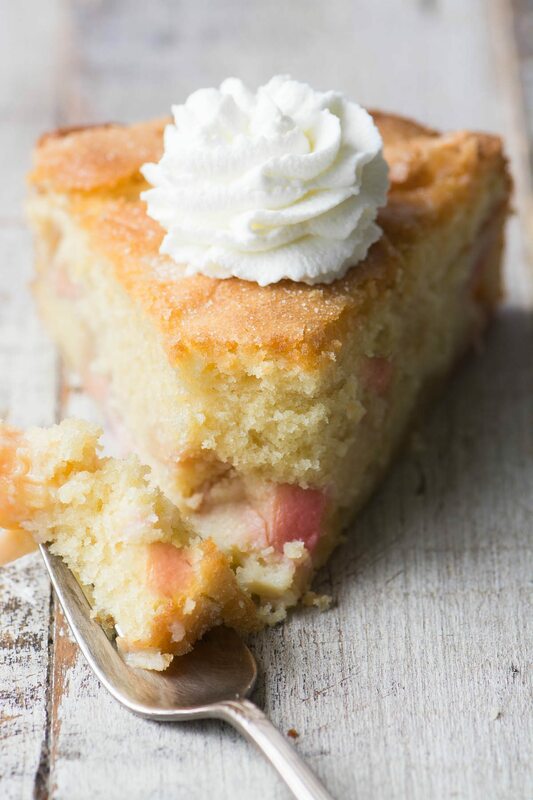 Love peach and with frangipane even better :) The crust sounds delicious, too! I have never baked a galette, but this one Sue, is a challenge! 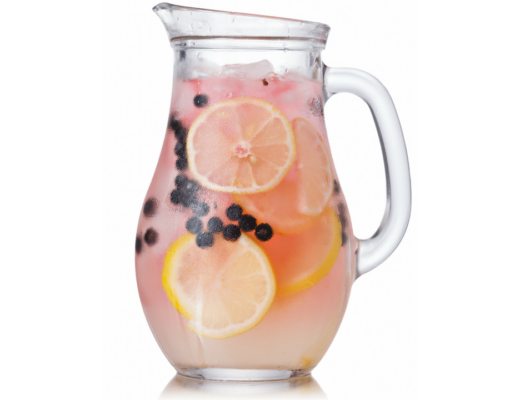 Simple, delicious, fresh! Thank you! Hi Sue, do you use ground whole almonds or ground blanched almonds for your frangipane? I adore white peaches and frangipane. This is my dream dessert! I use almond meal or almond flour that I buy in the supermarket, Jean. If you want to grind your own I think it’s usually blanched almonds, but honestly you can use either. That crust does look good. And I love galettes — such a nice shape, and I do like that they’re so easy to put together. I almost never buy white peaches — have to get some and try this. Thanks! 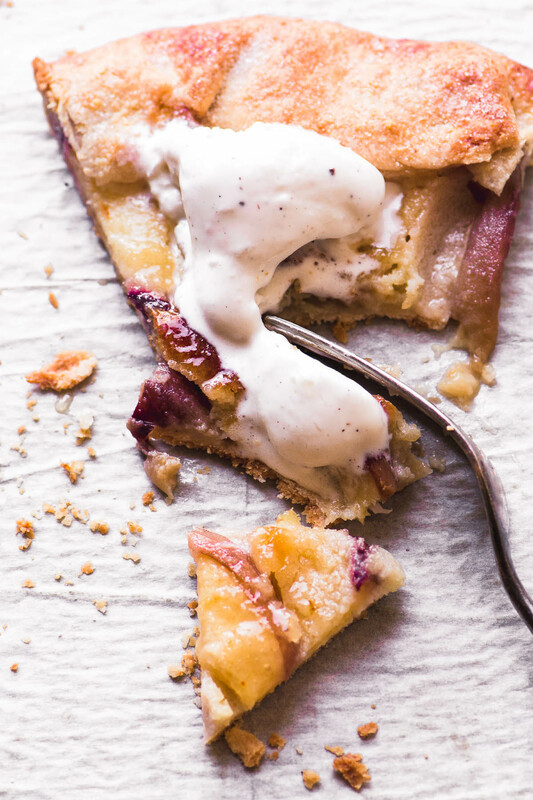 Your white peach galette with a layer of frangipane sounds deliciously good. I remember the first time my husband and I had a taste of white peaches, they were so good we bought an entire case. I avoided them for a time because I think I thought they’d be bland. Silly me! 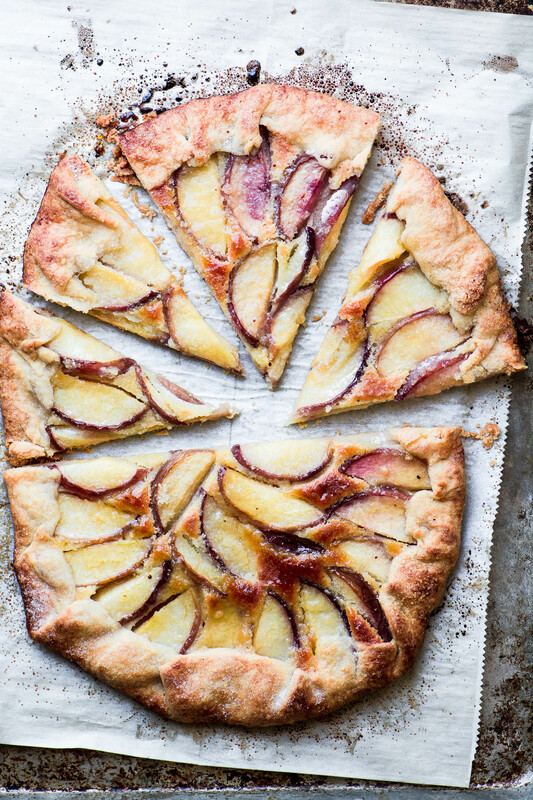 I’m with Chris – this galette looks absolutely amazing! 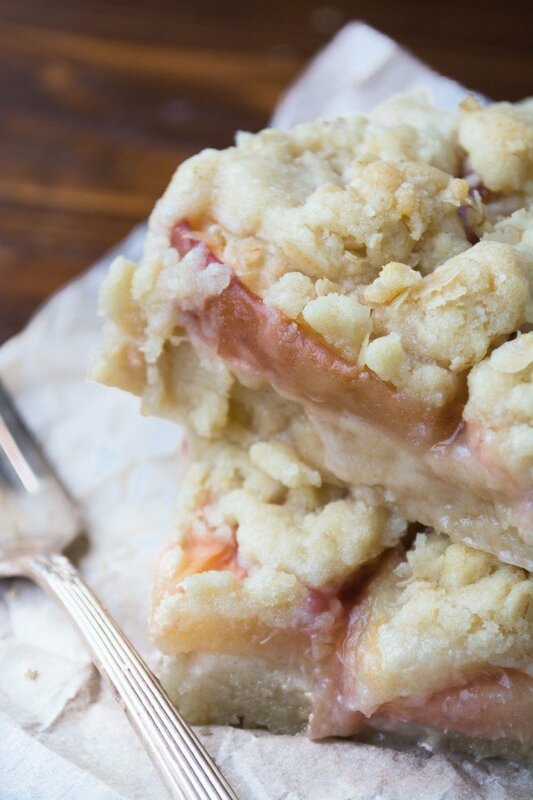 Great way to celebrate peach season! I’ve always loved frangipane – it holds it all together in a wonderful way. Sharing! Oh my, this looks beyond amazing! I love every little thing about it!! Beautiful!